Anyone in Australia or South Africa, I need to know the current position of the Sunrise and Sunset when they are in contact with the horizon. This measurement is very important so I can compare our July to your January. Also I would like to hear about the weather in your area. See the very bottom photo for current measurements and previous measurements for over a decade. Do NOT adjust for any declination. That is ONLY for Magnetic North or South. TRUE North is the north pole and TRUE South is the south pole. It is dead center between the Sunrise and Sunset. It is the center spot where our axis rotates. When measuring the sun position, magnetic north means nothing because the location is completely different. Magnetic north is not a fixed position. It frequently changes. It is a completely different measurement for different uses and does not provide the physical locations where the sun is viewed. True north or true south are Fixed positions and the center point of sunrise and sunset. It never changes. So please do not make magnetic adjustments to the physical position of the sun. Those are used when you are lost in the woods or checking magnetic fields. It would invalidate the measurements for our purposes. on which numbers did the sun rise and set. Such as .5 or 1 or 2 or 11 or 11.5 etc. This image below was in 2018. Notice that June 2018 was the same as 2014 but less than a month later in July 2018 you can see the sunrise and sunset had moved even farther north. This is unheard of. By mid July which I did not show, the sunrise and sunset were less than 5 degrees from True north. The sun should never be farther north in July than in June. June 21st is the summer solstice. The longest day and should have headed south following that day. 2015 is the same as 2006 due to the huge reversion wobble. Look how far it moved south from 2014 and how far it moved north in 2018. Then even further north in July 2018. All of these measurements were done on June 21st of each year except the extra measurement on July 12th, 2018. I only show years with noticeable changes. So 2012 would be the same as 2011. 2007 thru 2010 were the same as 2006. But the year of 2011 when the Tsunami hit Japan, there was a significant movement. 2015 and 2016 and 2017 were the same as 2014 as was June 2018. But just one month later you can see the massive change in July 2018. The past 18 months suffered nearly a tsunami every month. These are indicators of planetary shifting. Are there any news about the current earth axis position? Is the earth on its side? We’ll make those measurements on the June 21st solstice and into July. We have seen many abnormal and unexpected changes this past year. It is difficult for most people to conceive. The link doesn’t work but I have been getting some curious readings from the UK on positions of the sun and the moon when they should both be over the equator at this time of year even with the axis shift. The suns magnetic field and the bar magnet nature of the planetary magnetic fields should prevent this from being otherwise. degrees-north of the sunrise,about a 5 degree shift on the horizon–Over! (what pre-06 would have been normal),already,since 1st March. Last 3 days,did not measure,but by eye,looks like an acceleration of this particular shift.Erratic changes in wild bird behaviors here.Ex:courtship/singing behaviors normally mid-April. (another example,a week ago;in more’coming-spring’weather regionally;flock of wild geese heading direct south,not north.This doesn’t happen in this flyway area,mid-March).My pets- last several days are more’restless’.Local deer,’skittish’.Severe ringing in ears,several days ago;back today.Yesterday+last night very strange’electro-shock’sensations. (Nothing else here of diet,health,etc.to account for that). Thank You,again,for this-your observation today.Will hope to hear of correlations soon. Increased ringing in the ears a definite. But those symptoms should be checked for diabetes as well. Something weird is definitely occurring with the orbit and axis. Perhaps we are tumbling on our side. No diabetes,etc.to account for my’symptoms’. ‘official’proof of what such experiences have been.& could almost-always track-back;find my way,regionally/cross-country first-time,or after 1st time w/map 1,200 +miles,to/from places..like ‘ley lines/geospiral’s’-usages for Native Americans/other’native’cultures’ pathways around the globe). P.S.I used the word’tumbling’to try to convey earth’s rotational-spinning+the wobbles=Together. Tumbling came to mind based on our extended solstice last July and our unseasonal solar behavior and the sun directly over the poles so it is not unreasonable to picture the earth tumbling on its side as it orbits the sun beyond seasonal expectations. As everyone knows I am coming close to creating a greenhouse but I also came upon this stunning solar blue ceramic birdbath fountain which caught my eye. I finally managed to rebuild a new keyboard. Animals definitely are sensitive to changes in our electromagnetic fields, gravity, axis shifting, toxins and many other changes in our environment and planetary fields. People are not as sensitive to those changes… although there are a very few who are the exception who can detect changes. Headaches, nausea, vertigo, ringing ears are a few symptoms which may affect those who are sensitive to changes although these are also symptoms of diabetes or high glucose levels. A hangover, for example, is due to high glucose levels from too much alcohol. So a high level of glucose or blood sugars whether from alcohol, Halloween candy or diabetes can have these symptoms as well. I encourage people to look at the big picture. Many things can cause similar symptoms. Animals are an excellent indicator because they don’t binge sweets or alcohol, although they can have diabetes. Group behavior is a definite warning sign although it could be from toxins, radiation, viruses or diseases or perhaps a bad group leader leading them all astray. So it is imperative to consider patterns and big picture causes. Storms, air pressure, weather issues… but most certainly shifts in our axis, change in our Coriolis loop behavior, construction ground vibration, changes in the lunar gravity on tides, etc. Always be sure to consider all issues. The reason I found this blog is because I noticed the Sun’s path is slightly different. After reading a few papers, I think Zharkova is right and we can expect a severe Solar Minimum now that Solar Cycle 24 has finished. This is, however only a short episode in the regular Solar Cycles that we are all familiar with. The Sun also has Long Cycles. Over the long term, gradually the Summers will become shorter but very hot in the Northern Hemisphere followed by long, dark and severe winters. Weather in the Southern Hemisphere will be milder in Winter and cooler in Summer. Then after an extended period, a few hundred or so years the Southern Hemisphere will have the short hot summers and bitterly cold and dark winters and the North the less extreme. This is a regular part of the Long Solar Cycle that has begun. I was referring to the symptoms Dean mentioned as a caution to have checked. There is no grand solar or otherwise. That is a gov’t hoax to keep everyone from tracking the sun position on the solstice in June & July which clearly shows the shifted axis. I don’t allow gov’t hoaxes by their paid lapdogs on here (the sources not you). This is an honest site. Wow. You can read that? I was able to open the link ok. It might be worth adding that most of the solar system planets are on the same side of the sun as we are again, last year all of them were through July including minor planets. 2 days ago I found this Site=confirmed are my own,layman’s observations in Southwestern NY state.+All my own,near-6 years of ‘research’,on factual stats from scientific sites as: arcticnews blogspot;suspicious observers;volcano discovery;so many others,all helped me.. but this..really crystallizes all-relevant, into this 1.That explains all the above.Having observed the sun-shifts,in the years+seasons as-charted,I found NO One locally-when approached,who had realized such,fully. But I knew,know what I’ve seen. I have read that Professor Valentina Zharkova the lady who has found a reliable formula and pattern in the magnetism of the Sun has predicted that Earth will have a new tilt as the temperatures drop and everything changes. She says that this new trend will last for about 30 years. There are videos on youtube and one lecture that she gave but the quality of the latter is quite poor, well worth looking into. Her work is freely available to read and study. At least she doesn’t sound like a gov’t hoax which is refreshing but most scientists lack the necessary engineering skills to understand the effects of inertia or balance & effect. Thus she believes the sun’s magnetic field is to blame without considering the effect it would also have on the other planets & objects in the solar system. Our problems are caused by changes in the weight of the ice on Antarctica which acts as the gyroscopic anchor for our axis tilt… and it will last a lot longer than 30 years. Try thousands. Historical patterns suggest 11,000 years. It is too late to fix it now, so all they can do is to spoon feed the population with sugar & what they want to hear. I don’t do that. I only tell the truth & how to survive. No shock & awe & everyone can believe as they wish. I agree that the change is a long term cycle. The 30 years, I believe, is the settling in period. It coincides with Martin Armstrong’s super computer, Socrates, predictions in general. We can’t fix this, it’s much bigger than humanity. We can help each other by sifting, learning and sharing information as I can see you are doing already. Polar ice is part of it but not all of it, this is a repeating cycle. I have studied Ice Ages at university level as part of my degree. The whole planet is in flux, we haven’t completely come out of the last Ice Age. The weather patterns are changing rapidly and there is an increase in volcanism. All other solar system planets have had recent increases in activity. It is fundamentally solar in origin, our planet is reacting along with the other planets. What Zharkova’s team has found is a workable model that has proves accurate when tracing back known Ice Ages and is able to project forwards. Her aim was to document these solar magnetic formula findings, everything is publically available to inform us. I was adding to your information, not wishing to detract . I appreciate your work and am glad to have found your blog. I don’t post hoaxes even if the person believes the false info. This site will not become a platform for hoax or wild false theories regardless of the sources. I post truth only. Anyone who understands bar magnets would know the magnets of opposite magnetic poles line up with the suns bar magnet & aligns the planets equators with the suns. The planets cannot invert contrary to their polar magnets. However, if Earth is on our side, the molten core would slowly move to align the fields. There are some planets & moons like ours which don’t rotate or produce a magnetic field. They are held in place by gravity or inertia. They can change orientation since they have no magnetic properties. Earth cannot invert opposite of its magnetic alignment. There are some magnetic solar system toys which allow you to learn about magnetic properties. The magnetic field is not affecting the axis shift. 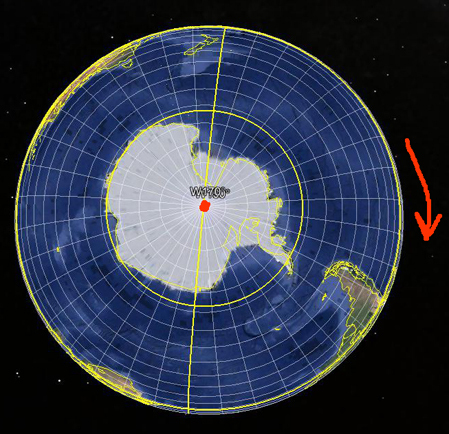 Only the south pole affects our axis tilt. Even NASA agrees after they stole my info. I wasn’t well enough to answer this until now. The person who wrote that article doesn’t have a clue to what they are talking about. This just happens to be one of my 68 fields of expertise of which I was a national and international expert.So I know what I am talking about. Communications systems have never used magnetic north to base their systems, timing and synchronizations because it has never been stable or reliable enough. At my last involvement we were using GPS for communications timing as well as Aviation, banking, etc. Even the transportation mapping systems use GPS. The military may use something else. GPS as I have mentioned did not shift with the planet, so they have been using software patches to emulate a normal functioning GPS by subtracting the differential between where the satellites should be and where they actually are. Prior to GPS we used Loran C for timing. So it makes no difference whatsoever where the magnetic north is located because no important systems rely upon it. The last time magnetic north was used was back in the 1940’s. Scientists are basically a bunch of liars willing to stab each other in the back to gain fame regardless of the BS they are spewing and have no compunction at stealing the work of others like NASA stole mine. I don’t mind them using it, but I do mind when they take credit for my work. I had to fight them all over the shifting axis for years. Now they are trying to take credit but are still minimizing the data which all of us knows better. They are pawns and hirelings of the gov’t to keep the true info from the public but at least they cannot hide the sun where we can clearly see how far off it is on the solstice. There is an absurd movie on Netflix called Oceans Rising which goes through a ridiculous scenario of magnetic pole shifting. Total nonsense but might be entertaining for someone who believes the gov’t hoax. If we are currently rotating on our side as I suspect, then the magnetic north will eventually shift with the vertical rotation of the planet. It is simple to track with a compass. Don’t waste your time with those hoax sites. Those are all intended to divert public attention from the real issue. A couple months ago I posted a comment about the trillions of tons of weight contained in just one inch of ice melt at Antarctica. So it doesn’t require massive melting of the glaciers to affect the axis tilt angle. Everyone thinks they have all the time in the world because they do not realize just how heavy water is. I believe it is one ton per cubic meter but I would have to look it up. If you break that down into an inch across the entire antarctic continent, it is more than enough to shift our axis several hundreds of miles every couple years as it has been doing since 2004. But expect to see dozens of false explanations for quakes, volcanoes, subsidences and animal behaviors or blaming the mass deaths of starfish on a virus without bothering to mention the trillions of tons of irradiated oceans destroying their immune system to protect those trillions in kickbacks from subsides or just like they blamed sightings in the 50’s on swamp gas. That was the doing of Richard Bissell who created Project Grudge (prelude to project Blue Book). The same Bissell of the CIA who was fired by JFK for Bay of Pigs. Hynek, the director of Project blue book became a believer. Most of what you hear is gov’t hoaxes and cover ups ran by the CIA. The more I observe and the more I read (books not on web) the more I come to the conclusion that our star (the sun) has a binary twin not yet discovered, that would explain everything neatly. Our precesion (of the equinox speeding up and slowing down), our wobble, our shifting poles and pole reversal, The tilt of the earth, so extreme at the moment, AND the Crazy weather. More research is needed and honesty from the people who KNOW! It sure as hell ain’t caused by HUMAN INDUCED GLOBAL WARMING OF CO2 gas, that only makes up 0.02 percent of the atmosphere! It also explains why the other planets (in our solar system) are shifting as well.We are a Magnetic & Electric universe (people included), & everything is connected both electrically and magnetically. Binary star solar system makes the most sense! NOT to mention that Binary star systems are the NORM and OUR solitary star system is in the minority!!! Oh well Iv’e put it out there NOW! I suppose the MIB will be knocking down my door NEXT! Actually, the MIB hirelings only attack genuine issues and whistle blowers who are revealing true issues the gov’t wants to remain secret from the public. They encourage people to spread inane theories. Especially ridiculous stories which are so absurd it makes the public roll their eyes in disbelief… like that guy in the 50’s who claimed to be going on joy rides with his Venusian buddies in their saucers. The gov’t never attacked him. In fact, they encouraged him with media attention. As a scientist and engineer I can guarantee there is no validity to any of those ideas. There is no second sun within our solar system nor any rogue planet within our system. The axis is shifting because Antarctica acts as a gyroscopic anchor which controls the tilt and balance of our axis. As the glacial ice melts on a landmass, it allows the axis to shift. It doesn’t take much. Just an inch of ice melted is more than trillions of tons in weight. The more it melts, the more we shift. As we shift it affects the temperature and weather. As we shift, the moon also tries to shift with us and the increased pull of lunar gravity is causing the planet to tear itself apart. Also, we have two large holes in the ozone layer and a sheared atmosphere above the north pole. When the axis tilt was normal, the holes were located above glaciers which reflected the heat and solar rays back into space through the holes. After we shifted, the holes were over land in the north and over ocean in the south. The hole over the north is cooking us like a microwave oven because those solar rays are no longer being reflected back into space. Most of those hoax ideas are created by gov’t paid hirelings to divert the public attention toward shock and awe hoaxes rather than the genuine issues. All of my info is verifiable which anyone can easily see. I have been tracking this issue since 2005. I explain things in simple English and everyone can look out their window on the summer solstice to verify the info I am providing. Those gov’t hireling hoax sites may be exciting but not the truth. The dual sun images are from Tatooine on Star Wars films. Another gov’t hoax to divert the public. THE Great Pyramid of Giza had the ability to concentrate electromagnetic energy through its chambers to create larger pockets of energy at its base, according to startling new research. Experts continue to unravel more and more mysteries of the 4,000 year old pyramid and the latest once could help boost renewable energy in the current day. Scientists from Russia have discovered that Ancient Egypt’s biggest pyramid can focus electric and magnetic energy into its chambers to spark higher levels of energy. Researchers state if the same effect can occur on a smaller scale, then it could lead to new and more efficient sensors and solar cells. 4.13.1.3 What Is a Pyramidal Cell? Pyramidal cells are distinguished by their prominent apical dendrite and basal dendritic tree (Figure 3). They comprise ∼70–90% of all neurons in cortex. Pyramidal cells form rich plexuses of connections, often called intrinsic lattices or horizontal patches, within cortical areas. With the moon being off I wonder if it is possible that the planet is not only on its side but the orbit it off as well because if our orbit was still normal and we are just tilted on our side that would not explain the shadow on the moon being off. Also the extreme cold weather the northern hemisphere has been experiencing I suspect is just normal arctic weather with the earth tilted into the polar region considerably more due to the severity of the tilt. We all knew the winter would be more severe due to being further from the sun. Our chemtrails of late have been all but non-existent so any attempt to hide something in the sky must be more south of us in Northern Ontario because we do have good visibility and they surely don’t need to cool us anymore than we are currently into the -40’s C. Our snow depth is currently at about 3.5′ and it is impossible to break trail with the snowmachine due to the snow not having any crust layers within it from normal melting or rain. It is a fluffy sugary consistency without a bottom. I’ve never seen snow like this in 25 years living here; it’s probably that ice nucleated snow I have heard about. The moon is likely trying to pull itself with the earth as it shifted with the tilt. The moon is probably the cause of most of those quakes, severe storms, volcano eruptions and cracks in the ground. I’m suspecting you are not seeing all of my comments to others on various posts such as one I answered yesterday on a 2007 post. I receive all comments on my administrators page. There is a menu for recent comments you can look at but it is fairly far down the menu column. I’m not sure what options the software provides for following comments and posts, etc. but look at them the next time you receive a reply or create one. There are options provided for you to follow at the bottom of the comment. The software only shows the comments on the post the person created a comment and any replies from me or someone else. As for the moon, its orbit is being pulled as we tipped over. The Laws of Physics are forcing the moon to follow the earth so its reversed magnetic poles remain aligned with Earth’s poles. (Like magnetic poles attract while opposite magnetic poles repel). The moon’s orbit is trying to follow the earth as we tipped over so that does change the shadow as it pulls into place and it may be causing the severe wobbling some of us have seen. The increased pull of the moon’s field is affecting weather and tides and earthquakes and tearing scars in the land and the space junk falling on our heads. At this size, any changes of the moon or the earth are very slow changes. Just as we are much slower than the movements of atoms. The smaller scale objects are much faster motions than we are. I posted an image on one of my comments a couple months ago when I was describing the moons orbit as diagonal which I saw one night while I was bringing in the groceries over a 10 hour period. I didn’t watch the alignment of the shadow. Just the orbit. David has been keeping me updated on the lunar positions. The moon is consistently off normal and the orbit changing as it tries to orbit the earth at our equator while being pulled by the suns magnetic fields. But it is not one of my fields of expertise except lunar images. We are definitely sideways but we may be wobbling and I’m not sure how long that will last unless our molten iron core adjusts to sloshing to match the suns north and south poles magnetic poles as we rotate on a daily basis. It gets very convoluted trying to keep up with the suns fields. Uranus is sideways and I believe Saturn or one of its moons are upside down but I haven’t dug into the issues in those cases. Definitely a headache to follow since our situation is constantly changing. But the diagonal orbit of the moon definitely indicates a continuous effort to match the orbit around the earth but it isn’t sure where to go. We don’t have much rainfall or snow here in Dallas. The chemtrails help bring precipitation around the year. If you remember, Bush W lives here. Canada is much smarter than the US but Canada still continues to follow everything we do. So most of the time, Canada agrees with everything we do even though they know better. When they vote on a UN Agreement they just follow everything we do or say or hide their heads in the sand and pretend they didn’t hear anything. However, UK & Australia do not follow us on things like GMO products (such as GMO Soy and Corn) or drug safety (like Thalidomide… although I think Canada may have changed their opposition to it recently). Clearly, we are bribing or terrorizing them. Two items in particular I know about were the CIA conducting experiments on mental patients in a Canadian mental hospital and the NSA having their eavesdropping systems built in Canada. I have a copy of the PO for that equipment. Also the chemicals in all of our petfood brands were made by Menu foods of Canada which killed tens of thousands of pets. I lost 7 that week and 3 within two weeks in 2003. The 2003 were killed by a toxic fungal virus. I learned quite a bit from my USDA agent who told me about the horrific attempts to kill off our pets. He was a meat inspector and was a vegetarian and the same with his cat whom he kept on a vegetarian diet. He told me how the pet food companies were sending him samples of pet food and how his cat sniffed at it and tried to cover it up. Even his cat knew it was toxic. That happened about 2 or 3 weeks before the petfood massacre. When these toxins, experiments and eavesdropping equipment were made in Canada but used in America, there was no way to track down the culprits and go after them. Or afford a lawyer and lawsuit in a different country. The snow probably has powdered aluminum and SF6 in it because that is what the airplane company which sprays the chemtrails for the gov’t says they use to create the clouds and precipitation which they spray into the skies. I also saw them spraying above scattered clouds to create a thick overcast. They are also spraying virulently when we are trying to obtain the sun positions during the solstices. Not only are they spraying to cool down the planet and increase the precipitation (which unfortunately ends up in our food, they now appear to be creating a full cover overcast over target cities so we cant see the sun anymore during the summer solstices. Spring and fall are always normal and overcast coverage is not needed. Winter only needs a few weeks of overcast and the chemtrail clouds are not needed at night. Ever notice how the skies are clear at night but overcast during the entire day. However, if too many people are asking about the moon, they may start chemtrailing at night as well. It is also colder because the sun is over the poles during each winter of each hemisphere. The only way the sun could be over the pole is if the planet was sideways where it could point the pole directly toward the sun. It could not do this in an upright position. The pole would have to point directly at the summer time pole while the winter pole is opposite pointing away from the sun. Remember, do not adjust the degrees for True north. True north is the north pole which is always mid way between the sunrise and sunset. My friend John Shaughnessy published this on Jan 31, 2019. I have his book Pyramid Gravity Force. I think it important to watch the below videos on the pole shift he just published. His theory coincides with yours. You might be amazed. “The stone circles align perfectly between the Sun and earth at an extreme ice age tilt around 90 degrees tilt like the planet Uranus, the stone circles were designed to monitor the months of the year based on tilt and the earths wobble during very extreme living condition on earth. Sunset in Perth 29th January 2019 at the midway point between 2 and 3 o’clock position facing South! At 4pm local time sun was in the 5 o’clock position very high in the northern sky! Well here’s a first last week January 21st COLDEST SUMMER DAY IN PERTH’S RECORDED HISTORY!! Whilst the REST of Australia had heat wave!!! that lasted 4 to 5 days! We’re back to semi normal temps (not as hot as it usually is this time of year HERE in Perth). I’m enjoying the cooler temps, BUT still FREEZING at NIGHT once the sun goes down it’s like there’s no residual heat left, It just goes cold. I cant believe I still have a blanket on bed at night unheard of in the last 25 years I’ve lived here, once October / November rolls around the blankets go in to storage and it’s top sheet only NORMALLY! I still have bloomin doona on bed for gawds sake! Canaries are still hatching babies! I still think the worst is yet to come and we’re 3 months behind. Have they mentioned any antarctic currents cooling the ocean near where you live? If not that then the sun is not close enough to the tropic of Capricorn to heat up the land at night. As it moves more over Australia, then the nights will start heating up. But the seasons will change fast due to the new angles of the sun as it approaches the tropics then the Equator on Mar 23rd. It will start cooling down after that as you approach your winter. Are your birds inside or outside? When I had indoor birds, they laid and raised families year round. You also have a lot of ocean around your position where the sun is being absorbed by the dark oceans until it starts moving over the land again. You can see this at sunrise or sunset by the positions. Using south as the 12 on a clock face. Probably about 10 and 2 0r 9 and 3. Since the sun went a lot further south during this summer for you, the heat was being absorbed by the ocean and reflected by the antarctic. Normally it would have been over the tropic of Capricorn on Dec 21st. Now you are waiting for the sun to get back to the tropic of Capricorn because it was 4000 miles farther south over Antarctica on Dec 21st than it was when we were normal. It will move really fast and the heat will be upon you day and night before you know it. But our orbit also appeared a month off last summer for us. Definitely antarctic currents, when I look at the radar map you can see that is why we are cooler, BUT that is usually well finished before NOW as the Tropical monsoon troughs from up the NORTH usually dominate the weather patterns here at this time of year (normally) starting in November they have JUST Started this week to become more prominent! Hi MMC, i taught you might like to see this video of the half moon on its side rather than vertical as normal. Everything seems to be show we have rotated onto our side. You wouldn’t believe. how many notes I’ve received. I also had a hireling attacking and swearing The axis had not shifted and various other things we all saw last year and the heatstorms as well. They do this when we get too close. They are too dumb to know this cover is blown. Over a million people or twice that number have already. The only reason to use chemtrails when the sky is overcast is if there is no visibility would be to hide the sky. Remember the matrix? Here are some free youtube videos to watch. January 12th Sunset in Perth at the 2o’clock position setting around 7pm, so it’s moving north but is it supposed to move so fast/far in just 5 days? Yes. Because of the extreme tilt, the distance has increased over 5000 miles each way just to reach the tropic lines plus the distance from the tropics to the equator in addition to the 1500 miles each way. So that is a total of nearly 6500 miles from Dec 21st to Mar 23rd and another 6500 miles from Mar 23rd to June 21st, etc. When the tilt was normal, the sun only traveled just over 1500 miles between Dec 21st and Mar 23 and 1500 miles from Mar 23rd to June 21st. So you can see it has to travel 5000 miles further each way than it did in the 20th century before the shifting began. That requires the rapid daily changes in position to travel so much faster and farther with the increased tilt or even if we may be sideways. The north pole still points at a fixed position as we orbit the sun, thus continuing with our seasonal changes, even from a horizontal position… although we are only left with about a week of spring or fall weather due to the rapid movement of the sun as it travels each way. This is also causing extreme weather conditions and changes in the Jet stream and Coriolis effect, etc. Plus extreme heatwaves in summer and bitter cold winter storms. As the ice is melting at a super fast rate, it causes more moisture to evaporate increasing humidity and precipitation of rain and snow. It’s not actually traveling faster, it is the angle of the tilt controlling the way the sun interacts with our planet. I noticed that the oil companies are jacking up the height of their oil platforms in the sea due to the rising sea levels. So our gov’t knows. But they can’t stop lying. EARTH’S SHIFTING MAGNETIC FIELD: Earth’s magnetic field is changing so quickly that researchers have been forced to update to the World Magnetic Model ahead of schedule. Developed by NOAA and the British Geological Survey, the model is widely used for precision navigation of devices ranging from nuclear submarines to the common smartphone. Your own phone may be affected. EARTH’S SHIFTING MAGNETIC POLES ARE CONFUSING YOUR PHONE: Pick up your cell phone and look at it. That rectangular marvel of modern technology contains thousands of lines of code. Among them is the World Magnetic Model (WMM)–a program that helps your phone navigate. And it’s in a bit of trouble. Researchers have announced that the WMM needs an emergency update because Earth’s magnetic field is changing. In part 9, “Pole Shift”: Solar flares are already known to change the earth’s rotation, now imagine one 100 to 1000 times larger than what is known. How does the crust unlock from the mantle? Would a tilt be included or rotation change only? A pole shift is already underway. SOMETHING NEW! We have developed a new predictive model of aviation radiation. It’s called E-RAD–short for Empirical RADiation model. We are constantly flying radiation sensors onboard airplanes over the US and and around the world, so far collecting more than 22,000 gps-tagged radiation measurements. Using this unique dataset, we can predict the dosage on any flight over the USA with an error no worse than 15%. Some 41,000 years ago, a complete and rapid reversal of the geomagnetic field occured. Magnetic studies on sediment cores from the Black Sea show that during this period, during the last ice age, a compass at the Black Sea would have pointed to the south instead of north. Moreover, data obtained by the research team, together with additional data from other studies in the North Atlantic, the South Pacific and Hawaii, prove that this polarity reversal was a global event. Some 41,000 years ago, a complete and rapid reversal of the geomagnetic field occured. Magnetic studies of the GFZ German Research Centre for Geosciences on sediment cores from the Black Sea show that during this period, during the last ice age, a compass at the Black Sea would have pointed to the south instead of north. What is remarkable is the speed of the reversal: “The field geometry of reversed polarity, with field lines pointing into the opposite direction when compared to today’s configuration, lasted for only about 440 years, and it was associated with a field strength that was only one quarter of today’s field,” explains Norbert Nowaczyk. “The actual polarity changes lasted only 250 years. In terms of geological time scales, that is very fast.” During this period, the field was even weaker, with only 5% of today’s field strength. As a consequence, Earth nearly completely lost its protection shield against hard cosmic rays, leading to a significantly increased radiation exposure. The largest volcanic eruption on the Northern hemisphere in the past 100,000 years, namely the eruption of the super volcano 39,400 years ago in the area of today’s Phlegraean Fields near Naples, Italy, is also documented within the studied sediments from the Black Sea. The ashes of this eruption, during which about 350 cubic kilometers of rock and lava were ejected, were distributed over the entire eastern Mediterranean and up to central Russia. Materials provided by Helmholtz Centre Potsdam – GFZ German Research Centre for Geosciences. Note: Content may be edited for style and length. Since August, the magnetic north was 20 degrees. The last few days it was 5 degrees. Today, it is 15 degrees. If we are sideways as our sun indicates since that is the only way the sun can be directly above the poles during each respective solstice, we are still rotating toward our east which is why the sun rises in our east whether we are upright or sideways. But rotating on our side changes the behavior of our molten core and affects the behavior of our magnetic field and magnetic pole position. This is not the same as our physical north & south poles which are fixed locations where the axis spins & that location never varies. But the magnetic north pole moves around based on the molten core and the position of the molten iron it contains as the earth rotates. Imagine pudding in the center of a rubber ball which is rotating. Try a clear plastic ball with pudding inside and try to rotate it. First upright… then sideways rotation. If we are sideways where the poles are horizontal, then it would be reasonable to conceive the inner molten core of the planet would rotate to align with the magnetic constant so the northern magnetic pole and southern magnetic pole would match with the sun’s magnetic poles. As with bar magnets, “like” magnets repel where opposite magnets attract. All the planets except Uranus align with the sun in this manner. It is why all of the planets align at the equator at the ecliptic plane and they are so uniform in alignment. If a planet were to shift above or below the equator, the magnetic fields would be imbalanced. So the molten core has to rotate to match up with the sun from our present orientation, It could cause our rotation speed to increase like a spinning magnetic ball in water by placing the like side of a bar magnet to repel it which makes it spin faster. Everything on a planetary scale always occurs much slower than we do. But that could also cause extreme changes in our length of days & nights and an increase in our gravity. Hopefully not. The magnetic north is currently 20 degrees off. It is not unusual for the magnetic poles to walk around by 5 to ten miles further per year. This has been occurring as long as I have been around and was reported deep in Canada & Russia as well. It was also off center & the planet was wobbling back in the late 1800’s, just before the 20th century began. We also had a huge wobble between 2014 and 2018 like a spinning top when it is ready to fall over. You can see it on the bottom 2nd photo on this post. So if we are sideways (which I have not yet confirmed) then I would expect the molten core to move to the equator so the north and south magnetic poles would match with our sun. Even if we are just shifting from our previous axis angles, the center core would eventually change its orientation to match our tilt angle and remain aligned with the suns magnetic orientation. Opposite magnets attract. I can’t think of anything other than a compass which would be affected. Our mapping and computer sync systems all use GPS because magnetic poles are constantly moving. I have seen the northern magnetic pole located deep into Canada back in the 1980’s. I think the fear mongers are trying to make people afraid so they will subscribe to their youtube channel and earn a lot of money for the number of hits on their videos and subscribers. It is all about money and they are using fear to scare people. Having the field shift will change the orientation of the magnetic field which protects the planet from the sun flares and CME’s. But as long as the field is intact then we should be ok depending on where any holes in the field may occur which would let in the solar particles. We are on a spherical planet no matter so the magnetic field would protect us regardless which way it is situated. But I wouldn’t recommend getting your info from Youtube. Any nut can post videos on there and most of them are only after money, power and attention. I recommend Wikipedia even though they revise history or the NASA or USGS websites for details. Or the Huffington Post as better sources of information. But you would need to cull out the lies. Even the “Earth Sounds” website may have articles about magnetic fields from global news sources. But my compass shows the magnetic pole at 20 degrees from true north… the physical north pole where our axis rotates. It has been at that position since I first checked it in September. Before GPS, planes used to use the magnetic field for navigation and this would screw up their instruments. But modern planes use GPS and signals from airport locators to navigate so the magnetic field would not affect them. As I said, it was far off from the physical north pole back in the 80’s which I remember and was also reported back in the late 1800’s by HAB… the real one… Hugh Aukincloss Brown not the book which fictionalized HAB’s theories. So beware, the gov’t may be using a hoax scare to divert the public from things like our axis shift and the Russian hackers and a psycho president. This is a normal condition of the magnetic poles to move and the molten iron core is likely to be reorienting with our axis shifting. Just as pudding in the center of a rubber ball would shift as you turn the ball. Does anyone really care if it is near Siberia? It wouldn’t be the first time, Do they think the Russians are going to steal it? Talk about Paranoia in our gov’t. They are so afraid they will be going to jail for treason and election fraud, they will do anything to make the public fear the Russians as the bad guys. Our fearless leader fears he is going to be brought down for this crime so he is going out of his way to have all the gov’t agencies involved in Russia bashing like they did during the cold war propaganda. They will soon be rolling out another McCarthy to terrorize the public. More diversion thru scare mongering. Sorry I don’t know how that Anonymous vid got attached. Probably a virus. I fixed it. If we are sideways where the poles are horizontal, then it would be reasonable to conceive the inner molted core of the planet would rotate to align with the magnetic constant so the northern magnetic pole and southern magnetic pole would match with the sun’s magnetic poles. As with bar magnets, “like” magnets repel where opposite magnets attract. It is currently 20 degrees off. It is not unusual for the magnetic poles to walk around bu 5 to ten miles per year. This has been occurring as long as I have been around and was reported back in the late 1800’s, just before the 20th century began. So if we are sideways (which I have not yet confirmed) then I would expect it would move to the equator so the north and south magnetic poles would match with our sun. Even if we are just shifted from our previous axis angles the center core would eventually change its orientation to match our angle and remain aligned with the suns magnetic orientation. I can’t think of anything other than a compass which would be affected. Our mapping and computer sync systems all use GPS because magnetic poles are constantly moving. I have seen the northern magnetic pole deep into Canada back in the 1980’s. I think the fear mongers are trying to make people afraid so they will subscribe to their youtube channel and earn a lot of money for the number of hits on their videos and subscribers. It is all about money and they are using fear to scare people. Having the field shift will change the orientation of the magnetic field which protects the planet from the sun flares and CME’s. But as long as the field is intact then we should be ok depending on where any holes in the field may occur which would let in the solar particles. But I wouldn’t recommend getting your info from Youtube. Any nut can post videos on there and most of them are only after money, power and attention. I recommend Wikipedia even though they revise history or the NASA or USGS websites for details. Or the Huffington Post as better sources of information. Even the Earth Sounds website may have articles about it from global news sources. I’m going to give the same reply I gave to BJ. If we are sideways where the poles are horizontal, then it would be reasonable to conceive the inner molted core of the planet would rotate to align with the magnetic constant so the northern magnetic pole and southern magnetic pole would match with the sun’s magnetic poles. As with bar magnets, “like” magnets repel where opposite magnets attract. All the planets except Uranus align with the sun in this manner. It is why all of the planets align at the equator at the ecliptic plane and they are so uniform in alignment. If a planet were to shift above or below the equator, the magnetic fields would be imbalanced. So the molten core has to rotate to match up with the sun from our present orientation, It could cause our rotation speed to increase like a spinning magnetic ball in water by placing the like side of a bar magnet to repel it which makes it spin faster. Everything on a planetary scale always occurs much slower than we do. But that could also cause extreme changes in our length of days & nights and an increase in our gravity. Hopefully not. So if we are sideways (which I have not yet confirmed) then I would expect it would move to the equator so the north and south magnetic poles would match with our sun. Even if we are just shifting from our previous axis angles, the center core would eventually change its orientation to match our tilt angle and remain aligned with the suns magnetic orientation. I can’t think of anything other than a compass which would be affected. Our mapping and computer sync systems all use GPS because magnetic poles are constantly moving. I have seen the northern magnetic pole located deep into Canada back in the 1980’s. I think the fear mongers are trying to make people afraid so they will subscribe to their youtube channel and earn a lot of money for the number of hits on their videos and subscribers. It is all about money and they are using fear to scare people. Having the field shift will change the orientation of the magnetic field which protects the planet from the sun flares and CME’s. But as long as the field is intact then we should be ok depending on where any holes in the field may occur which would let in the solar particles. We are on a spherical planet no matter which way it is situated. But I wouldn’t recommend getting your info from Youtube. Any nut can post videos on there and most of them are only after money, power and attention. I recommend Wikipedia even though they revise history or the NASA or USGS websites for details. Or the Huffington Post as better sources of information. Even the “Earth Sounds” website may have articles about it from global news sources. But my compass shows the magnetic pole at 20 degrees from true north the physical north pole where our axis rotates. It has been at that position since I first checked it in September. Before GPS, planes used to use the magnetic field for navigation and this would screw up their instruments. But modern planes use GPS and signals from airport locators to navigate so the magnetic field would not affect them. As I said, it was far off from the physical north pole back in the 80’s which I remember and was also reported back in the late 1800’s by HAB… the real one… Hugh Aukincloss Brown not the book which fictionalized HAB’s theories. This morning 9th Jan 2019 I made a point of checking sunrise here in Perth (even though the scarp delays seeing sun) at 6am the sun was in the 11 o’clock position, by 7am it is in the 10 o’clock position (me facing south) the sun appears to be moving very rapidly northwards as the day gets on. I also wanted to post a picture (cant seem to figure out how) My friend took pics last night from her south facing lounge room window, and the sunset was on the right hand side of that window “what the”, AND Weird colours. if you email me directly I’ll send pics to you if you like? Your info is very valuable. On your temperatures I was unclear. Are you alternating from extremely hot days to extremely cold nights? If so it is likely the change in the angle of the sun which is over the ocean and antarctic instead of its normal angle over your landmass is part of the problem and perhaps the increase of melted ice in the ocean is also another factor. If it repeats our situation last summer then you may experience heat waves at the end of January and into February. I’m not sure how we can perceive the sun’s direction from photos. If you look at my photos on the post, these are from Google earth and I use landmarks near me to pinpoint the angle of the sun, then I draw lines to show the changes. On photos from ground level, we would only see the sun and would not know which direction it is located but I will be happy to look at them. I will send an address. Be aware that once the sun rises above the horizon at sunrise or just before sunset, the sun will slide sideways until it touches the horizon. So if the sun begins to set at 2, it may slide sideways above the horizon until it reaches #1 and touches the horizon. Or it may be the reverse in your hemisphere. It also travels in an arc away from the latitude of the sunrise and sunset. All reasons why I specify taking the measurement when the sun is in contact with the horizon. That gives us a stable measurement. This sliding especially noticeable at sunset is usually a surprise for most people until they try to video the sun. cloudless day in years! on ventusky if you select cloud cover view in the last 2 years there hasn’t been a cloudless EARTH! Sun is about the same NOW as on Dec 21 !!! As near as I can figure it is almost as if the planet is 3 months out of SINC! IE: Summer is YET TO COME! With Canaries I’ve been breeding for 30 years, I know I’m doing the right thing! it is ONLY the weather that has changed! Temperature is CRAZY! 40c in the daytime,Once the sun goes down there is no heat I have NEVER had a blanket on in summer, this year IT IS BLOOMIN COLD COLD at NIGHT ! ESPECIALLY IN THE PRE DAWN!! I think I lucked out and the earth tilt MEANS I’m in the best place on the PLANET! BECAUSE if it rolled to the NORTH as it appears! that means Perth is furthest away, I can always rug up , BUT you can only get so COOL especially if power goes out! Plus I’m Mega insulated. SEAFOOD, I WONT EAT ANYTHING FROM THE PACIFIC OCEAN !!! IT IS POISON!!! the Animals are our best indicator and the SKY! look up and observe all will become visible! I believe the weather & solar changes are affecting the birds. My suggestion was to counteract the changes. Perhaps more artificial light and warmth might work. I have had my sweet gum trees with autumn colors in June. They shouldn’t change until October. I have been tracking the changes since 2005. Up until 18 months ago, it was a steady progressive shifting as the sun was seen further and further north. The only aberration was the extreme reversion or wobble between 2014 and 2018… actually Aug 2017… which is when the monthly tsunami’s began but I didn’t measure until June 2018. For the last 18 months the weather and planet has gone mad. I believe the wobble was like the last gasps of a spinning top as it slows down and begins to fall over. Since every tsunami reflects an axis shift we appear to have reached the peak of saturation. Now we are at the point where I can’t predict the changes and effects. I had expected heatwaves similar to the ones we experienced. However, ours did not begin until the very end of July so perhaps yours will occur at the very end of January. It appears that everything is a month off. Out of Sync as you described. Are your oceans colder than normal? Perhaps the melting ice is affecting your temperatures or it could be the fact that we are a month out of sync. For the sun to be almost directly above the poles on both hemispheres, we would have to be sideways like Uranus. It is physically impossible for the sun to be in that position if we were still upright… but as I said, I still have to verify the orientation of the constellations has rotated before I can say that for certain. Since everything has changed, it makes it imperative for me to know the conditions you are experiencing so I can compare it to ours. In my case, Texas was cooler than the arctic circle last July and August. They were 106F while Texas was in the low 90’s. Also LA, Japan, Canada, Scandinavia and I think UK as well were all experiencing triple digit heat. If I were to speculate I would envision our planet on its side with the poles horizontal, still rotating which makes everything appear visually normal from our perspective and continuing to orbit while still pointed in a fixed position as we were before this all began, which causes our seasons. The daily changes of the sun’s position above the poles might be like trying to focus a cheap telescope on a star but the target keeps moving. Perhaps a bit of a new wobble which would be understandable since the molten core would be unsettled from the extensive shifting and would behave like a tire out of balance. But since the path of the sun has an extra 4000 miles to travel each way to and from the tropic lines plus the distance from the tropics to the equator (equinox) in the spring and fall, the lengthy change from Summer to winter eliminates most of the fall and spring seasons to less than a week instead of the 3 months due to the increased distance of the bookended extra 4000 miles. We are in uncharted territory. The more info I have for comparison, the faster I can determine our true situation. If we are sideways it isn’t a bad thing because it was quite gentle and the conditions are survivable without loss of infrastructure. Only horrific weather storms & conditions and global upheavals. But those will continue to get worse with each year as the glaciers all melt & the sea levels rise by 30 stories; 297 ft. The planet is tearing itself apart from pulling the moon to follow our shifts while raining space junk upon our heads. As I remember, Skylab crashed into Australia. So you may be in the path of that space junk. The residents of Indonesia have it worse. They are on an unstable tectonic plate… like trying to balance standing on a bar of Ivory soap in the bathtub. I believe they need to evacuate Indonesia before they are consumed by the continuous upheavals. It does act as a warning of what to expect. For each tsunami, an axis shift has occurred. Feel free to share any more changes. Your info will be the best comparison with our own situation and enable me to determine our true situation instead of speculating. I try to keep everything based on fact but everything is outside of my expectations at the moment. If the photo comes out below, showing a horizontal south pole facing the sun, you can see that you are not receiving any of the sun heating up the land because it is being absorbed by the ocean and reflected by the antarctic ice and snow. Also the ozone hole is likely over the ocean as well. It was over the US and Canada during the day last summer which baked everyone like a microwave oven. There is a hole over both poles and our shifting has offset the holes. As I think about this, before the shift you had sun shining directly over the land heating it this time of year. Now, just this past year during the summer, the sun is at too far of an angle to the south to produce enough heat on your landmass during the day to keep your area warm at night. It should warm up as it moves north again. Cant say for sure about sun rise I have a hill to the East and don’t see sun till 8am here in Perth WA. Australia. but for sure sun is setting at the 1 o’clock position this summer when in the past has been 3 o’clock position.When I FACE SOUTH. I have lived in same place for 25years NOBODY can believe how far southerly the sun is rising and setting. as for weather we don’t get autumn & spring anymore just winter and summer! I breed canaries for a hobby, this year only 2 young hatched from 4 breeding pairs, also my fig tree hasn’t had fruit yet and we are normally eating them at xmas.Just as a side note I have a Crookes Radiometer set up in the lounge room, used to get hit every morning and afternoon and for this year the sun hasn’t hit once! I set it up so sun would hit it in the morning and afternoon through the windows from east and west, hasn’t moved in 10 months! Thank you. Absolutely perfect. That is exactly what I needed. And the other info is excellent. Please feel free to add any further info. Do you know if the sun is any further south now than it was on Dec 21st? It may sound like an odd question but this is what happened to us last summer in the northern hemisphere. Ours was .5 from true north. The sun in July was actually farther north than it was in June by a sizable amount. That’s not supposed to happen unless our orbit has shifted as well as the axis. I think we have shifted onto our side and it is wobbling a bit because it seems to change from day to day but I can’t be sure until I look at the stars in June and compare with my old star charts to see if the constellation positions have rotated. It is just a thought but when the sun is directly over the poles we would have to be sideways for that to occur. I don’t trust the internet sites. Only my star charts from the 1980’s which is something they can’t change. But the book only has summer configurations. I had a plastic adjustable star chart but I can’t find it. If the sun is setting at 1 facing south then the sunrise should be about 11 but it will start moving at an arc during the day which is why I always ask everyone to measure when the sun is in contact with the horizon. But in your case, the one measurement tells us what the other is even if you can’t see it. On the birds you might try some calcium grit during egg laying season to encourage eggs. There are also special nutrient mixes you can use during mating season. Animals seem to react to these changes more than we do. They have a natural instinct better than we do. Please keep us informed about any weather events, heatwaves, unusual animal behavior or seismic events, etc. in your area. Since you are a mirror image for us it helps me to compare with our events in our summer. The arctic circle had 106F temperature last July and August. That is beyond belief. It will cause massive melting of the glaciers. How are your temperatures so far? The heat waves may not hit until the end of January if it does like it did during our summer. Also, are you getting any radiation in your seafood from Japan? Every fish they have tested up here contains radioactive materials. I gave up seafood.